2012 Pantone Color Of The Year Is……. Yes, I know that you were holding your breath just waiting for Pantone to announce its 2012 Color of the Year. The wait is over and…..drum roll please…. 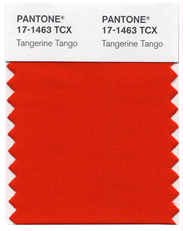 “Tangerine Tango” has been announced as the winning color. The 2011 winner was said to be “inspiration to face life’s everyday troubles with verve and vigor,” with Tangerine Tango building off of that by giving an “energy charge” to move forward. Pretty dramatic language, but these people take their colors seriously. The process of choosing the color of the year is quite an ordeal. Pantone employees look the world over for color influences in media, music, and art, searching for the hues that most affect people. With the digital age well underway, they also look at designs created electronically.